No matter if it's a single task or the need to develop processes for a complex assembly of components, the right team of individuals can be the deciding factor between on-time delivery or an unsuccessful launch. Without question, every great team needs effective leaders and talented skilled team members. We have a track record of either integrating quickly within a team you've already assembled to ensure the project stays on track, or diligently assembling a cross-functional team and providing the leadership needed to ensure the project will be successful. Every successful project needs a plan. 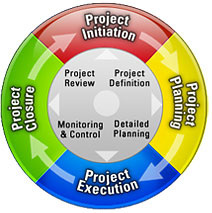 The details of the plan needs to be clearly communicated to the project team. We achieve this with the use of various project management tools such as project plans (ie: Gannt charts), dashboards, action lists, flow diagrams, and of course, clear verbal and written communication. We put our experience utilizing the appropriate tools for the task at hand to ensure that success isn't left to chance, but rather is part of the plan.